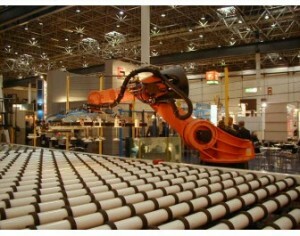 Demand for industrial robots is expected to hit 32,000 sets and installed capacity is expected to exceed 150,000 sets by 2014. With robots entering carmaker, tobacco machinery, food packaging, metalworking, plastic/rubber processing, chemical, medical and electronic components, automation is becoming more than a popular conception. Among all types of robots, robotic palletizers are winning extensive favor from manufacturers thanks to outstanding performance. In recent years, coastal regions in China are witnessing increasingly higher labor cost, resulting in hiking operating cost and labor shortage for processing and manufacturing enterprises. To relieve the pressure for labor cost, enterprises are choosing to use robots in place of traditional labor. In such sectors as logistics, food and petrochemicals, robotic palletizers are playing an important role. They can complete palletizing work accurately and efficiently. They reduce labor intensity for workers and improve product quality. (1) Robotic palletizers feature simple structure and few components, promising low failure rate. (2) They are compact in size. They facilitate arrangement on production line in customers’ factory buildings and leave large space for warehousing. Robotic palletizers can be configured in small space and facilitate effective operation. (3) They are suitable for many applications. In case of change to product size, volume, shape and pallet dimension, customers may use touch-screen to make corresponding modification without affecting normal production. On the other hand, it is difficult and even impossible to modify mechanical palletizer. (4) Low energy consumption. Normally, power consumption for mechanical palletizer is around 26KW while that for robot palletizer is around 5KW, thus substantially reducing operating cost for users. (5) All control functions can be operated via control panel, making operation an easy job. (6) It is only necessary to position the lifting point and decking point, making training and learning an easy job. As a latecomer in the robot automatic production line equipment market, China is experiencing a period transforming from traditional equipment to advanced manufacturing equipment. Currently, industrial automation is becoming an inevitable trend to promote the development of the manufacturing industry in China. With many automatic palletizing lines put into operation in China, the palletizing system will find increasingly more extensive market prospect and development potential.